quoted amount, change in delivery times without being previously discussed, etc. arbitration requirement if the amount of the dispute is $10,000 or less. 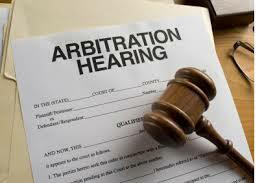 neutral arbitration program in place to help resolve issues. This is a more informal and less expensive than formal court litigation. The arbitration programs regulations state that the disputes of $10,000 or less on an interstate move and/or shipments must be submitted to binding arbitration, if no settlement can be reached between the shipper and consumer. Arbitration is not mandatory for claims above $10,000. However, it can be used to settle a dispute of more than $10,000; you are under no obligation to choose this method. If a dispute arises, that cannot be resolved by the movers claims department, a customer can request arbitration by writing to AMSA(American Moving and Storage Association) within 90 calendar days after the movers last settlement, or denial of the claim.